NOTE TO ACTIVIST GROUPS: We are making this video available at a special price of $59 to activist groups. Please order under our Activists' Page. This gives you the right to show the film in public as long as no admission fee is charged. TV rights are NOT available. In 1977, the award-winning journalist and film-maker, John Pilger, made a documentary called Palestine Is Still The Issue (1977). He told how almost a million Palestinians had been forced off their land in 1948, and again in 1967. In this in-depth documentary, he has returned to the West Bank of the Jordan and Gaza, and to Israel, to ask why the Palestinians, whose right of return was affirmed by the United Nations more than half a century ago, are still caught in a terrible limbo -- refugees in their own land, controlled by Israel in the longest military occupation in modern times. In a series of extraordinary interviews with both Palestinians and Israelis, John Pilger weaves together the issue of Palestine. He speaks to the families of suicide bombers and their victims; he sees the humiliation of Palestinians imposed on them at myriad checkpoints and with a permit system not dissimilar to apartheid South Africa's infamous pass laws. He goes into the refugee camps and meets children who, he says, "no longer dream like other children, or if they do, it is about death." Continually asking for the solution, John Pilger says it is time to bring justice, as well as peace, to Palestine. NOTE TO ACTIVIST GROUPS: We are making this video available at a special price of $59 to activist groups. Please order under our Activists' Page. TV rights are NOT available. "[Pilger] allows the viewer to hear candid and powerful statements that it is vital for outsiders to hear. I would advise professors: If you don't have time to show the entire video in your class, at least show your students the first fifteen minutes. The frank comments by both Palestinians and Israelis...will provide the basis for a spirited debate among the students for the remainder of the class period." "Highly recommended for its bold analysis of the Palestine problem...crucial viewing for those interested in challenging their assumptions." 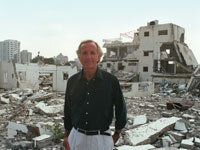 "John Pilger has made a well-informed and engaging documentary against the Israeli occupation of the West Bank and Gaza. His argument is clear and consistent throughout: the root cause of violence in Israel/Palestine is Israeli colonialism. Israel has dehumanized the Palestinians and subjugated them to the longest occupation in modern times, and the Palestinians have been resisting the occupation and fighting for their freedom and independence. These facts are incontestable, and Pilger presents them very well, mixing interviews, authorial commentary, and historical narration to convey a picture of a whole society degraded and denied its fundamental national and human rights." Besides playing the program straight through, you can also play it by chapters. The chapter stops have been chosen to give teachers and others immediate access to key portions of the film. In addition an extensive 20-page Special Report is included in the DVD-ROM portion of the disc. The report provides vital background information on the history of the conflict from 1897 to the present day. Included are a timeline, sections on the land area, the refugees, the PLO, the occupation, house demolitions, water, the settlements, Jerusalem, the peace process, five detailed maps of different ways that have been suggested to settle the land issue in the West Bank, the Al Aqsa Intifada, victims, the Israeli use of force, assassinations, the siege of the Palestinians, Operation Defensive Shield, the suicide bombings, Israeli conscientious objectors, why there are no international monitors, who supplies the weapons, international law, and hope for the future. Also included are an extensive list of websites, a bibliography, and a complete list of references for the statements made in the guide.